This Slovakian facility is not a public facility. It is for members only. Coordinated by Petr Skorepa. We do not offer services to the public, do not perform any treatment or other healing methods! We only allows you to stay in the dark for members, students, life and voluntary supporters of our association-association! It must be respected and not to interrupt continuous darkness, perfect darkness. For Western man comfortable is necessary to ensure maximum comfort. Therefore, therapies carried out in darkness completely darkened room with all the accessories, including the bathroom. Someone will use the time as well as cleansing and fasting had worn a nutritious liquid. Advance down the number of days of stay in the dark morning and the last one goes out to walk in the nature, where with great intensity aware of the wonder of nature and light. House “Darkness in the forest” is specially built for the purpose of stay in the dark in a quiet and peaceful position on the edge of the garden near the forest :). It is perfectly light and sound sealed. Cheeky soundproof ventilation technology used in recording centers will ensure perfect comfort of fresh air in both winter and summer without the penetration of light and sound … Everything is made right combination of natural materials, physical principles and advanced technology. Used herein several unique and yet simple technologies, for example, the air supply through a ground register and the cooling bed, which ensures heating in winter partial air or vice versa in summer cooling inlet fresh air (acts as a natural air-conditioning). Ventilation can be controlled from the interior mechanical shutters – most of the year running fully samočině – in an elaborate physical principle. Set to keep a person by measuring the average concentration of CO2. If necessary, it is possible to let go and quiet fan, which is located outside. This ensures a constant supply of fresh air without breaking 🙂 – which is important for staying safe. Thermal comfort is easily controllable (mostly men want to set a lower temperature and vice versa women appreciate more heat), which ensures the ceramic glass panels ( http://www.volf-infratopeni.cz ), which are completely silent, nelupkají, sparkle, necvakají, therefore, even in winter is house heat as necessary. Of clay on the walls and on the floor acting as a thermal storage mass provides a constant temperature and eliminates fluctuations. But it is also worth mentioning that logically need fresh air and over that it is possible to wind through the cellar – land registry, so in winter flows across the floor colder air (around 10-15 ° C) in the summer and warmer (around 18 -25 ° C). The room temperature can regulate themselves, but the floor is colder in winter. The walls, floor and ceiling are very well sound insulated heavy material – just earthen plasters flexibly suspended on isolation. This technology is used in the USA and England for recording studios and meditation centers, possibly as noise barriers along roads and highways just for the reason that this method of sound insulation, like 150 cm thick concrete wall! But moreover, it has the great advantage over various sophisticated solution or modern materials that absorb sound evenly in all frequency bands. The floor is 10 cm heavy materials – clay on the foam glass (which solves the thermal and sound insulation).Ventilation is also ingeniously resolved sound and door outdoor as well as indoor covered with good sound insulation. Interestingly, the usual sounds from the outside can not hear, but you can sometimes hear (though distant) plane or a barking dog. The house is built from natural materials. It is very well insulated 35 cm of straw in the walls and ceiling. Both inside and protects the supporting wooden solid construction and insulation plaster made of unfired clay, which regulate inter alia humidity around 40-50%, which is the optimal climate for human organism. The floor is recessed clay tiles plum logs.Even if the house is rectangular, so you can not find sharp corners, everything is curved, rounded and plastic. All finishes are made with natural oils and waxes, which contributes to the good feeling of the stay. Because artificial materials such as laminate flooring, coatings, paints, plaster, carpet, etc. Have a positive charge and therefore attract and annihilate negative ions. Therefore, as in the urban dwellings (the same is true for offices or supermarkets) is only 50-100 ml anions. and this is certainly one of the causes of various diseases of civilization and fatigue. The roof is green grass (ie, only overgrown), which also helps to maintain a constant temperature, even in summer, thanks to the cooling from water evaporation from the crop, and the whole house is from the north side, and partly from western countries přihrnutý. Now we’re just waiting for them to fully overgrown greenery (which will take a few years), to gain the expected visage “hobbit house”. Interior is a sofa bed – (can be stretched and training as well as on the bed) with natural mattress 100×200 cm from the workshop www.Nejfuton.cz . Fdrown, are inspired by Japanese culture and are an ideal choice if you want to pay attention to your healthy sleep in accordance with the demands of high-quality natural materials. Then there is the usual facilities such as duvets, pillows, sheets, towels, mattress on exercise, meditation cushions Zafu the workshop www.lavennis.cz . The house has a hall, so that did not get into the main room light and where the operator can carry drinks and food one day and go to the consultation. In a separate entrance room has a toilet, equipped with ventilation on an interesting and simple principle (when it blows should be a breeze to spin, wind head) … then there is a sink and shower (tiled mosaic) with hot and cold water – also suitable for therapy with water (alternating hot and cold water). Soon, hopefully, we will connect and home phone in talks with guardian. The house is new, we built it for over a year, we have invested considerable amounts of energy by the end of 2013 completed. The house is built on good energy place. Around the beds do not lead to any network, the nearest water pipe is 2 m and 0.5 m cable for electricity. This house does not in itself as a form emitter, some people here would then could not sleep. Alternatively, you can arrange the position of Orgonite or wooden pyramid on the roof of the house. Extras – Bonus: We can still offer a relaxing seating area in the pyramid, which is collapsible timber and designed for meditation, size is 2×2 m, it is possible in it and sleep … We can be rent disassembled, which you yourself at any time even in the dark fold. Also here you have the Tibetan bowls, didgeridoo, stringed instrument Kantelka and drums for self-healing aliquot tones and sound … well here it is to exercise 2x trapeze, straps and foam balls at training vision (feeling) around the mass. Břetislav and Karel are the wizard folks who facilitate a retreat in Chlistov, Klatovy Czech Republic. Posted in darkroom retreat facility. Tagged #darkroomretreat, #exhaustion, @altoyes, @frugivore, @SaskiaJohn1, czech r.
this is an account of Liam’s dark retreat i found online … i have reposted extracts from several posts. see the original and full texts here. So the time is at hand. 3 days until I begin my dark room retreat @ Sierra Obscura retreat center in Nevada City. The basic structure of the experience is like this: a residential home in the Nevada City area has been converted to a retreat space. The downstairs of the house has 5 individual rooms and one community room, as well as several bathrooms and a massage room. The upstairs of the house is where all the food for the retreat-goers is prepared, and where various servers stay and operate during retreat times. The retreat begins with 2 days acclimating to the space in dim lighting, followed by 14 days darkness, ending with 1 day integration. Here is a blog (ed: the site is no longer transmitting) site run by the center. So the basic idea is that I will have ample time to go inward, to meditate and contemplate, to observe and attune my awareness, to recalibrate my physiological systems so used to and abused by sensory overload, as well as many other things. I intend to use it as a time to go deep, deep within. To contemplate the years past happenings, and to integrate and embody as many of these powerful teachings that have come through to me in the Tao de Ching. Healing, release, renewal, rebirth. Rebirth. Going into the darkness, going into the womb to grow and develop and emerge anew. Though I am excited about the experience, I feel it will be quite a challenge for me! Just the other day I sat down and closed my eyes for 5 minutes, and just watched my breath and meditated, & it seemed like an eternity! But it was only 5 minutes. So I really can’t imagine just what my experience will be like for some 300-something hours in pitch black, but I imagine immersing myself in the dark for such a long time will enhance the light that much more, at the very least. So, 2 more quick things relating to darkness that have come up for me just recently, and that relate to the retreat @ hand and the postmoderntao blog. One is that I intend to have dark field blood work done before going in and after coming out. Dark field blood work is otherwise known as “live blood work,” and contrary to light field work, examines a complete, living blood cell. Last time I had an analysis done, I saw some pretty incredible stuff. One of my white blood cells looked like Florida, and I said to the Doctor, “say, what’s with this?” And the Doc said, “Well, don’t you have some relationship to Florida?” And I said, “Why yes, I am going to a yoga retreat there this December, and I’ve been trying to arrange my transportation there for the past week.” —-> So me thinking about Florida caused FL to literally show up in my blood. I have other friends who have seen some pretty wild stuff in there relating to their psyche, childhood, life experiences, things they need to heal or address to move forward, etc. One friend of mine had many of her blood cells in the form of yogini ballerinas. Cool huh? The second thing related to darkness is that I have by chance met a fellow who is opening a sensory deprivation chamber retreat center (really its a “day spa”) in the Nevada City area right before I finish my dark room retreat, and we have arranged for me to be picked up from Sierra Obscura on March 4th to go to one of the Sensory dep. tanks to see what that’s all about! The chambers are basically big water holding tanks that were originally used to transport Dolphins. In this case the water is adjusted to body temperature and is loaded with epsom salts, so one can’t feel the water and can easily float in it. This creates or simulates the very real experience of primordial womb conditions. Some people apparently have floated for as long as 6 hours, but I think a very common time is a 30 min. to 1 hour journey. So that will put the cherry on the Sunday of the dark field work & dark room retreat. Dolphin tank anyone? So okay, perhaps the picture I’ve painted of the coming 3 weeks of my life seems rather insane, but I embrace the possibility of deep transformation and realization, and hope whatever happens will be of practical use to me and my reality–all my friends and family, all networks, all my relations! Out of the dark, one month ago today. March 4th. So much to recount in the darkness, sitting in one little room for 2 weeks. And so much to recount of my last month in the light as well. Where do I begin? So was the darkness enlightening? Yes, I believe it was on a number of levels. My experience there was quite dynamic, ranging from all sorts of bodily sensations (wild buzzing of pituitary/3rd eye, pineal/crown), to various nightmarish and wild visions and dreams, with plenty of realizations and downloads of things that no longer serve me or anyone for that matter. I had dense, visceral, agonizing feelings of despair and helplessness and solitude. Feelings of pure joy and love and complete contentment. & on & on. I must say it was an amazingly rewarding experience on every level. I will recount several quick stories, with a general lack of detail to allow you all to fill in your own imaginative details. One day one I had to pee really bad. I couldn’t hold it. And I got lost on the way to the bathroom. And I couldn’t hold it. And I grabbed for whatever I could, and I grabbed a Tibetan singing bowl. And I didn’t have to hold it anymore. But I had to use a lot of scalding hot water and Dr. Bronner’s soap later to make sure the bowl wasn’t tainted forever. On another day I walked into the bathroom and stepped on what felt like tiny stones. And I reached for whatever it was, and they had a slimy texture, and they smelled funny. And I found out what the little stones were eventually. My darkroom retreat roommate-neighbor Rigzin had tried to dump rotten soaked almonds in the toilet, and she missed. Completely. I remember realizing/thinking/feeling that nothing really matters, that my return to source is inevitable, but the glory and gift of being a human being right now is beyond imagination and probability, so I need to take advantage of every moment to its fullest, cultivating awareness more and more every day. My pre-retreat post-retreat blood work analysis was profound. Before the Dr. said “this is very healthy blood.” After the Dr. said “this blood is exemplary, vital blood.” Wow! I came out with a blonde strip of hair. How does that happen in the dark? So that’s all for now. Spring emerges here, and I am loving the light more than ever. I’m not going to pretend my body or mind is in some sort of radiant transcendent healthful state, but for some reason I feel more surrender to every moment than I have ever felt. Come what may–I will do my best to give myself to the righteousness within me. I don’t have any more questions about anything. All the big questions that left my mind restless have been answered, and I must say, I don’t believe there is anything worth doing, accomplishing, or creating outside of me, outside of William/Will/Liam. There is no knowledge “out there,” no fulfillment to find, no happiness to pursue. It would seem that through all the people I’ve met, books I’ve read, experiences I’ve had, etc., the only work I feel drawn towards at all is inside. In other words, I would like to devote a great deal of time, energy, &/or effort into focusing my attention inwardly. You know, treat it like a 9-5 type thing, a whole new life style. From what I have read/been told/experienced thus far–a whole lot is possible when we simply sit quietly and close our eyes, and wait. So that’s what I’m going to do. A lot. Much love to you all!!! & of course I will continue to communicate with everyone through the dozens of modern communication tools–facebook, email, cellphone, skype, etc. And hopefully in person! NOTE: this website is now archived for information and enjoyment. it is currently managed by myself, Marion. Al To was the researcher, open to ALL flavours of darkroom retreating, to be openminded. once the website and facebook groups were established, to welcome ALL, then Al To could bow out. as for myself, i am interested only in Hygienic Darkroom retreating. Our society is not a restful and peaceful and regenerative and sustainable place. Stupidity is rampant. a darkroom retreat environment plus one enthusiastic adventurer i.e. ourselves, is a winning combination. we might just emerge from our stupor into our best ‘rest of our lives’. Also quite likely, is a regaining of our youthful vigor – pure intelligence. even perhaps an ability to make use of this renewing for our very best happiness! Regardless of our age! For all of us, for you, for your loved ones, your communities if not for yourself, join us for the ride. we are all of us welcome to dip our toes in the darkroom. to inform ourselves of the melatonin and darkroom research, it’s history and predecessors, associations; to gather the stories of darkroom experiences; to create a list of the presently existing facilities worldwide. we will leave the site up for all and any to use freely as a resource. please explore this site. There is so much here to read that is so wonderfully interesting and vital. It has thrilled each of us to have learnt so much, to have read each personal story and to have unearthed each of the 30 or so darkroom retreat facilities. If you want to contact real people, go the the facebook group and contact one of the active members there. We wish you well dear readers. We will post Updates below, as they happen. Read the Prospectus and updates. 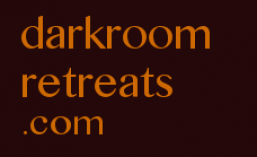 to enable interested folks to access experienced darkroom retreaters and their personal stories and practical info and networking via an online forum. this site is archived. there is no one here to contact. go to the facebook group instead. and speak to one of the members there. introduce yourself. the best and most useful and up-to-date information for yourself and others is to go to Andrew Durham’s website and download his book.